Dry air can present a number of health concerns for your home or office. Dry skin, bloody noses, and itchy eyes are all symptoms of dry air present in your indoor spaces. Dry air caused by low humidity can provide an environment that causes you to be more susceptible to health concerns. 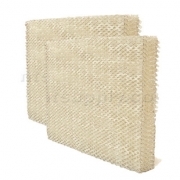 Carrier humidifier filters and water panels works to raise the humidity levels of your indoor spaces to a comfortable, healthy level for you and your home or office. 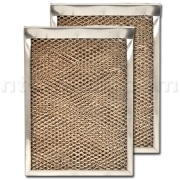 The Carrier humidifier pad (aka Carrier humidifier filter, water panel, evaporator pad) is constructed of an aluminum mesh designed to filter out unwanted particles and minerals in your personal filtration system. 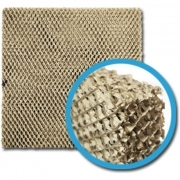 The aluminum mesh is coated with a clay-like material covering that absorbs water and removes minerals. The humidification process begins when water flows through a humidifier valve and soaks the Carrier humidifier filter. The clay-like coating absorbs the water. Hot, dry air from the furnace or fan coil then passes through the humidifier pad. The contact with hot air creates water vapor. From there, the vapor is then carried through the air system via the forced-air duct system and distributed throughout the indoor space, bringing moisture back into the indoor environment. For the maximum efficiency of your Carrier humidifier filters and water panels, it is recommended that you replace your whole house humidifier filter at least once per heating season. 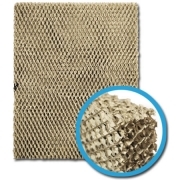 When your filter is in use for long spans of time, build-up can accumulate on the filter media, reduces the efficacy of the Carrier humidifier pad. 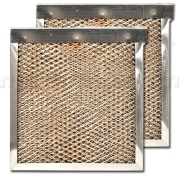 To ensure that future problems to your furnace system do not occur, routine filter changes should occur. Areas with hard water may require two changes per season to ensure peak performance.